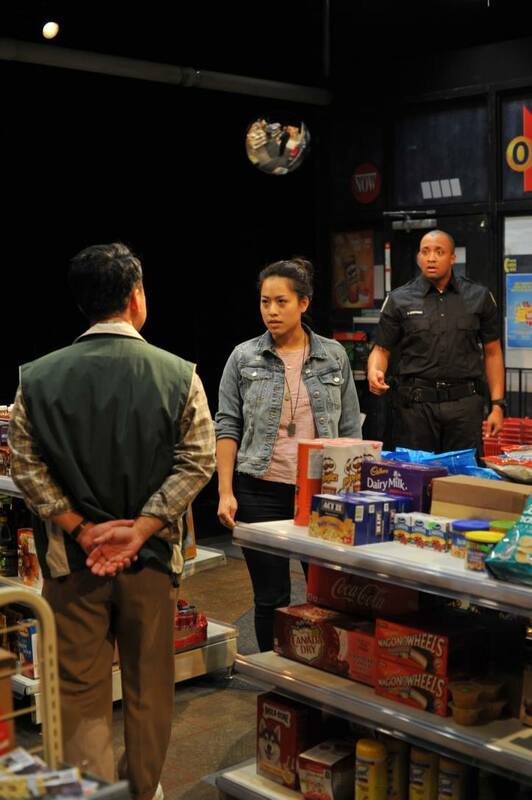 Raw and emotionally-charged, Pacific Theatre’s Kim’s Convenience is on stage now until October 6, 2018. 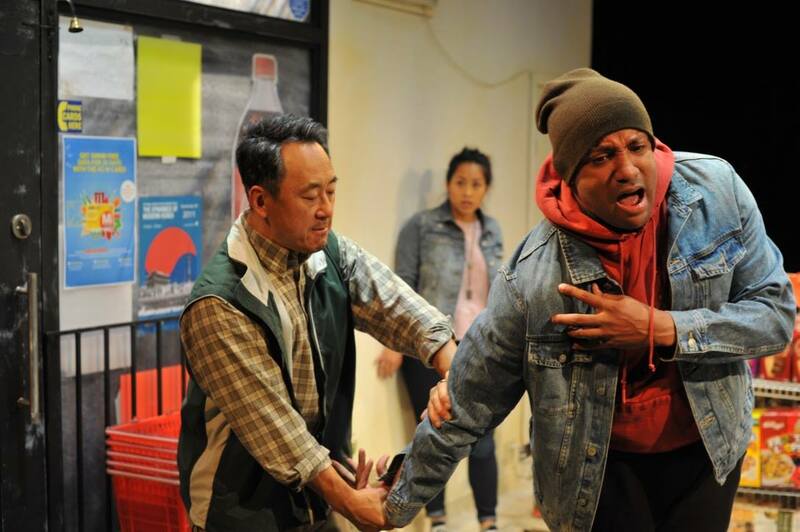 Written by Ins Choi, who’s also taken the play and transformed it into a successful CBC TV sitcom, Kim’s Convenience is not your average play. This one focuses around a Korean-Canadian immigrant story, filled with racist jokes, arguments over family obligations, and cultural differences. At times the family is joking and happy with each other, and other times they are nit-picking each other and clashing over generational gap issues. The storyline focuses on the Kim family, patriarch Appa, matriarch Umma, daughter Janet, and rebellious son Jung. 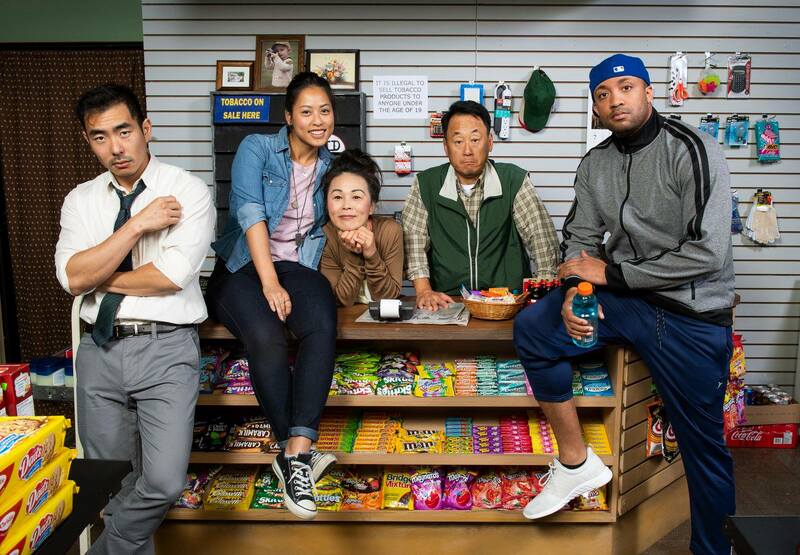 Appa runs Kim’s Convenience store, where he stresses about having Janet takeover the store since Jung ran away from home at the age of 16. Janet, being raised in Canada, does not see herself managing the store – she wants to be a photographer – family obligations vs. pursuing one’s own dream. I had the opportunity to catch the show at the Pacific Theatre, and it was by far one of the more impressive versions I’ve seen in comparison to the Arts Club version in 2014 and the TV show. James Yi portrays Appa, filling big shoes from the original Appa, Paul Sun-Hyung Lee. James Yi does an amazing job as Appa – his range in emotions has the audience in tears – laughing hard at his racist jokes or crying of his self-sacrifice giving up his own life for his children’s futures. His frustration shows in his relationship with his daughter, Janet, and the arguments are heated and emotional. It reminds me of my own experience being Canadian-born raised in Western culture clashing with my traditional Chinese father. Another outstanding standout is Lee Shorten who plays Jung. Lee plays a darker and more emotionally distraught version of Jung – very different than the clean cut version we see on TV. Instead, this Jung fears that his decisions earlier in life have ruined his chance to be successful. He compares himself to his more successful former friends, who all drive BMWs and live in big houses with their families. Jung regrets the decisions he’s made, sad at leaving his family now that he has his own. Jung is torn between making a life better for himself or giving up on life completely. This version of Jung is tormented, a lost soul looking for help and guidance, surprisingly turning back to the family he left behind. Pacific Theatre was able to setup a convenience store in their theatre space, with lucky audience members like myself being able to walk across the set in order to reach our seats on the south end of the theatre. They were really able to capture the basic essence of the convenience store with all the shelves stocked with food, lotto scratch tickets, cigarettes, and more grocery store props. 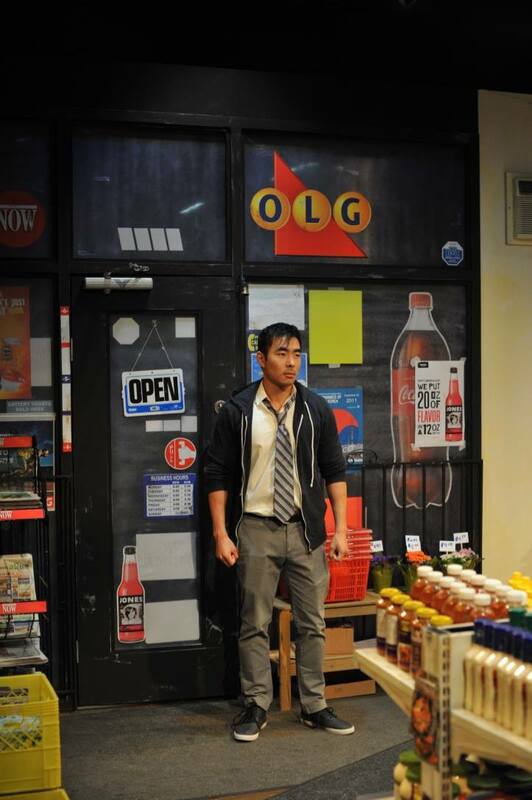 Pacific Theatre brings audiences to the set of the convenience store – built between the two audience wings – if you sit on the South side of the theatre, you will walk across the middle of the store. Make sure to suppress your urge to help yourself to a bag of chips or a chocolate bar before the show! Overall this play brings me back to the days when my parents ran a convenience store, my obligations to help in the store, and all the arguments and sometimes happy moments we shared at the store. I highly recommend anyone who has watched the TV show, or heard of the play, to go watch it. Existing fan or new to the show, you’ll have a great time with laughs, and you may even end up shedding a few tears, so be prepared! Kim’s Convenience runs until October 6, 2018. Full details and ticket info can be found here: pacifictheatre.org.